Butler’s manufacturing professionals have been fabricating teak platforms and their associated hardware for many years. Our transom platforms are considered by many to be the finest in the world. Many of our teak platforms manufactured in the late fifties are still being used today. Our teak swim platforms can be custom made to your specifications, virtually any length, depth and thickness. They are pressure laminated using the finest Burma Teak. These laminations are glued together, but primarily held together with three inch stainless steel screws staggered throughout the platform to hold each of these laminations secure. 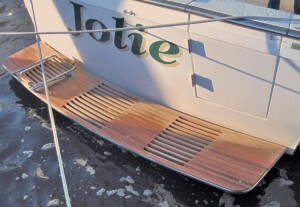 For maximum strength, all units feature a double teak strake along the aft edge as well as the transom edge. Polished stainless steel, brass or white vinyl trim (rub rail) is included with all platforms. The platforms are 1-1/4” or 1-1/2” thick and include all stainless steel fasteners necessary for mounting with the purchase of support brackets. 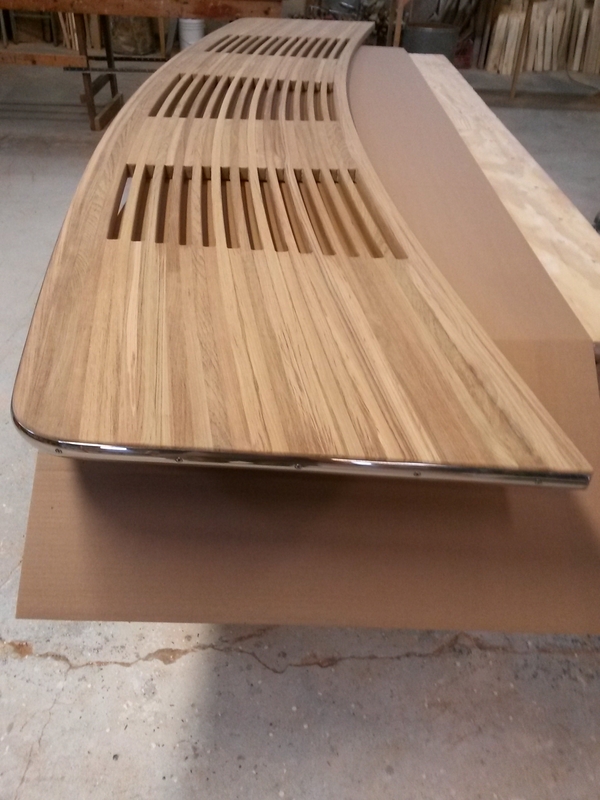 Our finished product is completed without being treated with teak oil. We purposely refrain from treating our platforms with teak oil so the customer can decide which finish they would prefer on their teak. Many choose to keep the wood in it’s natural state. 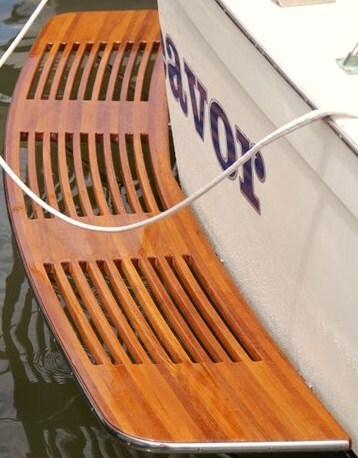 Since teak is known for it’s ability to withstand almost any weather and known for being one of the strongest, most durable hardwoods in the world, there is no wonder as to why it is popular within the boatbuilding industry. Aesthetically, the natural oil in teak not only protects the wood, but also gives it a dark golden color and an earthy aroma preferred by most in the marine industry. With each unit, we supply complete installation instructions for assistance when installing your new transom platform to your boat. 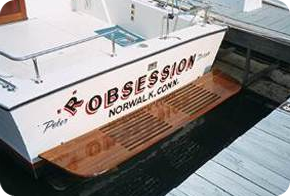 Our very extensive database of boat specs dates back at least 60 years. If we do not have your boat on file, print out our Transom Platform Measuring Sheet and follow the simple instructions for measuring. 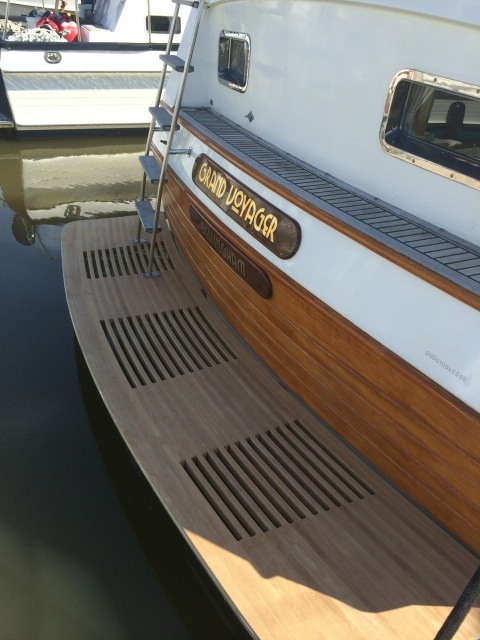 Custom Straight Platforms are offered for boats with flat transoms. 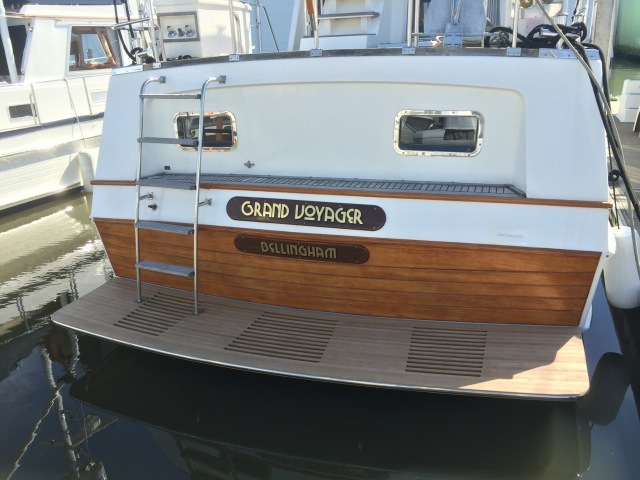 They are built to the same exacting standards as the Custom Curved units using Burma Teak and utilize the same corrosion resistant materials for long maintenance-free life under the toughest marine conditions. The CS Platforms can be supplied as retractable units at an added cost. The 30″ and 36″ models can be used individually or in pairs, with one on each side of the out-drive. They are well-suited for use with out-drives which kick up more than 45 degrees like the OMC models. The support systems have one short arm to allow for vee hulls.